For 20 years, Sketch has provided a space for Toronto’s homeless and marginalized youth, aged 16 to 29, to pursue art, music, dance, woodworking, the media arts, and other creative activities. Its advocates say it helps engage youth on a social level, above and beyond the basic shelter-and-food programs offered by the city. Personal empowerment comes from learning and honing practical skills that might be applied to real careers; even better is the sense of self-sufficiency and self-worth these activities generate. Four years ago, the Association of Registered Interior Designers of Ontario (ARIDO) launched a charitable initiative called ROI: Renew-Originate-Implement. 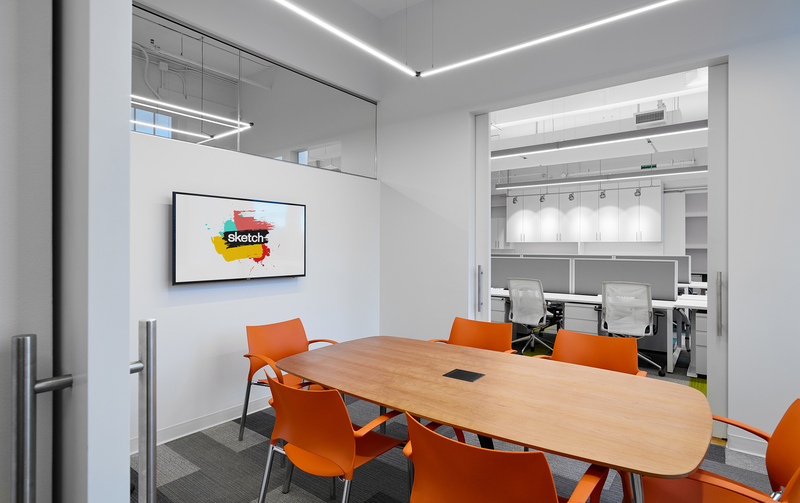 Its objective is to improve the way essential services and support are provided to Ontarians in need, utilizing the transformative powers of interior design. Previous recipients of ROI’s environmental makeovers include the CAMH Archway Clinic (2013), Fife House (2014) and Variety Village (2015). This year was Sketch’s turn. Rudy Ruttimann, Sketch’s executive director, says their need was great. The program’s 1,200-sq.-ft. administration hub, on the second floor of a converted high school in the Queen Street West neighbourhood, was cramped and chaotic. Entry into the space beyond the double doorway was blocked by a big photocopier and made even more unwelcoming by the positioning of tiny work cubicles that presented their users’ backs to hesitant newcomers. Ruttimann mentions the horrible lighting, the lack of proper storage, and the daily cacophony of up to 45 people noisily conducting business for the 1,200-plus clients that come through the program on a yearly basis. To conduct private meetings or arrange seclusion during her annual bookkeeping audit, Ruttimann used to staple a piece of black cloth to either side of her open office area with a Do Not Disturb card tacked to its front. Design team members Janine Grossman and Tabitha McCullum echo this sentiment. Grossman points to the dozens of suppliers who agreed to work on the pro bono project, and gives a special commendation to platinum sponsors Brigholme Interiors Group and The Pentacon Construction Group, along with engineers The HIDI Group. “We started designing in the spring, and everything was complete mid-September.” Just in time to celebrate Sketch’s 20th Anniversary. The front table she mentions takes the place of the photocopier machine, which has been moved into a secluded corner. Workstations, complete with Mac computers, Meda chairs by Vitra, and overhead sound-baffles to lower the noise levels, now present a sideways profile to the entry – welcoming but not intimidating. A large clerestory window lets natural light into Ruttimann’s office, adjacent to a small meeting room, both of which can become private by a simple pull on a sliding door. Built-in storage units reach up to the open mechanical ceiling, now freshly plastered and painted, and fitted with a new HVAC system. The bright white-and-teal kitchen area boasts a stainless steel fridge and dishwasher, as well as overhead shelving so that Sketch now has a place to display its many community awards. Thanks to ROI, Sketch now looks like what it is: an established and valued member of our society.